Experimental Tool Uses Light To Tweak The Living Brain : Shots - Health News An experimental technique called optogenetics is starting to change the way researchers look at the brain. The tool allows them to switch entire brain circuits on and off using light, and may help figure out what's going wrong in brain ailments from epilepsy to depression. When President Obama announced his BRAIN Initiative in April, he promised to give scientists "the tools they need to get a dynamic picture of the brain in action." An early version of one of those tools already exists, scientists say. It's a relatively new set of techniques called optogenetics that allows researchers to control the activity of brain cells using light. "This is fantastic," says Elizabeth Hillman, a biomedical engineer at Columbia University. "We can turn things on, turn things off, read stuff out." In short, she says, it provides a way to observe and control what brain circuits are doing in real time in a living brain. Eventually, optogenetics could not only help explain diseases like epilepsy and depression, but offer a way to treat them. But the technique needs some refinement before it can be used in people or in remote parts of the brain, Hillman says. Until just a few years ago, research on living brains relied on technologies like functional MRI, which shows which areas of the brain are active during a particular task. When scientists wanted to switch on brain cells, they used a wire probe inserted into the brain. All that changed in 2005, when a team at Stanford University showed how to control brain cells using light. "There was instant buzz about it," Hillman says. "People were sort of running around and saying, 'What is this thing, where can I get it, how can I do it?' " she says. Instead of activating just one brain cell at a time with a probe, researchers had a way to cause large groups of cells to fire without touching them, Hillman says. "You can select that very specific genetic cell type, and you can tell that specific cell type to react when you shine light on it," she says. If you select the right type of motor neuron in a mouse, for example, you can make the mouse start running with the flick of a light switch. It's also possible to control brain cells involved in pain and fear and moods. So there's huge potential for both understanding the human brain and treating brain diseases. First, though, scientists are going to have to overcome some big challenges, Hillman says. She outlined some of those challenges at a BRAIN Initiative meeting run by the Optical Society of America. For one thing, Hillman says, when you use optogenetics, "You're actually altering the genes of the neurons." That's because most neurons don't normally respond to light. So you have to add genetic material to every brain cell you want to control. Scientists can do that in mice with genetic engineering, but that's not an option for people. The other way to add genetic material is by infecting an animal with a virus that reprograms certain cells. This approach has been used in people, Hillman says, but carries enough risk that most optogenetic experiments in humans are probably still a long way off. Another challenge for optogenetics, Hillman says, has to do with delivering light to cells deep in the brain. "It's really hard to get light to go deep," she says, "and we all know this just from trying to shine a flashlight through our hand." Researchers are also finding that in some optogenetic experiments, light is reaching too many cells in the brain, says Hillel Adesnik from the University of California, Berkeley, who also spoke at the Optical Society meeting. "It's like slamming the thing with a hammer," Adesnik says. So scientists are looking for ways to deliver light with less force and more precision. "One thing that's been very much discussed," Adesnik says, "is how we can control the cells one at a time, or 10 at a time, or 1,000 at a time — but extremely specifically." 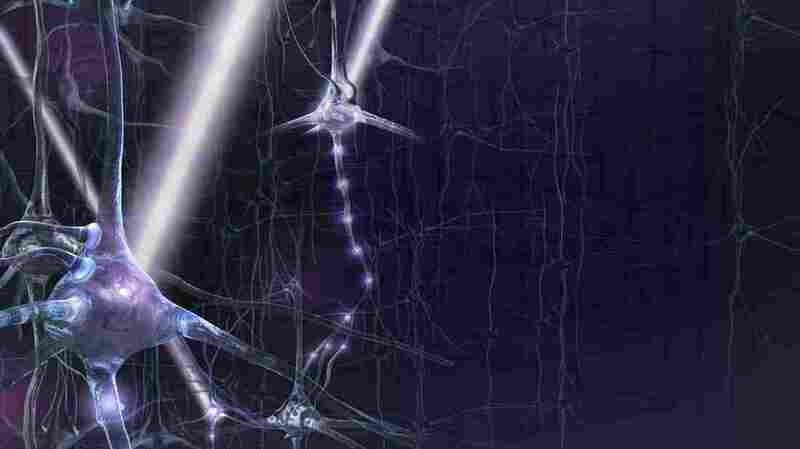 Despite these challenges, researchers see huge potential for optogenetics. Already, they say, the techniques are changing our understanding of disorders such as epilepsy. Scientists have known for a long time that epileptic seizures occur when brain cells start firing out of control. But they've been struggling to understand the role of brain cells called inhibitory neurons, which can reduce firing in other cells, Adesnik says. "Prior to optogenetics, there was no way to control these neurons and test hypotheses," Adesnik says. Now, he says, scientists have shown that by altering that activity of inhibitory neurons in mice, it's possible to start and stop epileptic seizures. The finding suggests that some day it may be possible to halt a person's epileptic seizure with a flash of light, Adesnik says. And by tweaking other networks in the brain, he says, doctors may be able to help people with Parkinson's disease, depression, or even schizophrenia.